A recent bout with migraines kept me from reading, so I turned to the next best thing, a book on compact disc. What a life saver. A day without a little reading on the side is never a good day for me. 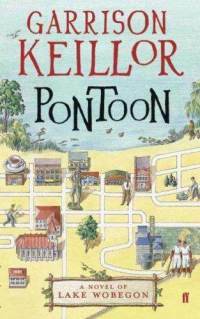 Pontoon, by Garrison Keillor is funny, wonderful and, like earlier Keillor works I have heard or read, filled with lyrical prose which caress my senses like a cool lake breeze on a hot summer day. In this book, Keillor pokes fun at the straight-laced Lutherans who inhabit his beloved Lake Wobegon. The story begins with the unexpected death of an older woman named Evelyn who leaves behind a letter requesting that her ashes be inserted in a bowling ball and dropped into Lake Wobegon. Her alcoholic daughter discovers many secrets about her mother which help her to turn her own rutted life around. In fact, Evelyn’s death changes many lives and in reading Pontoon, if we have not already recognized it, we come to realize how every life sends gentle ripples into the universe which touch the lives of many. This is a fun book which helped me to relax and heal. I’m glad I chose it. This entry was posted in Uncategorized and tagged Books, Garrison Keillor, Lake Wobegon, Lutherans, Minnesota, Pontoon. Bookmark the permalink.